I've just launched a Kickstarter project ... PhotoLarks: San Diego. If you haven't discovered Kickstarter, it's a way cool process for funding creative projects ... from books to films to gadgets to giant black Trojan horses for the Burning Man festival. You pledge a certain amount (usually as little as $1) and get a reward and the satisfaction of being part of the project. Your pledge only turns into a real contribution charged to your credit card if the project reaches its funding goal. 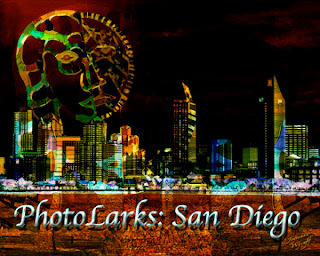 My project is part insider's guide to San Diego and part in-phone mini-photography workshop. Several of the top San Diego photographers have agreed to provide images and information about their favorite photo places and tips for taking better pictures. This will be put into an eBook, a DVD and a phone app. Turns out that Mr. Postcard himself, James Blank, lives in San Diego and will be part of the project. He provided the photos that are shown in the Kickstarter video. This has been way fun and I hope you'll check out my project at Kickstarter.